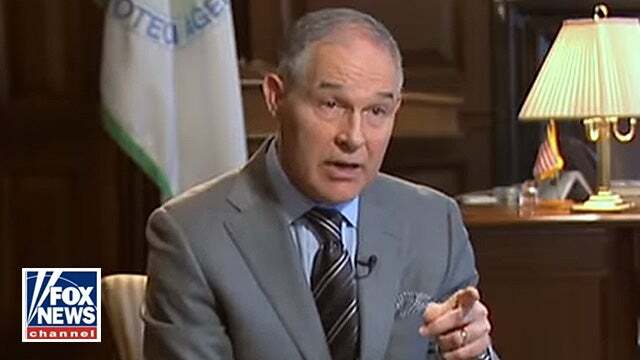 RUSH: Have you noticed how every political gun the Democrats and the media have is all of a sudden focused on Todd Pruitt at the EPA, the Environmental Protection Agency? You know, there’s an old saying — and you military people will, of course, nod your heads at this. “When you’re taking a lot of flak, you must be over the target.” Well, I think Scott Pruitt is over the target. Let me tell you what Scott Pruitt’s doing. Scott Pruitt is himself unraveling a whole lot of regulations that Obama’s EPA implemented. Now, the former administrator of the EPA, Gina somebody — can’t remember her last name — Obama put her in office, and she is out there complaining about Pruitt because Pruitt is specifically unraveling things that she and she alone did. And she’s complaining that administrators and bureaucrats can’t just go in willy-nilly and strike out things they don’t like. It’s exactly what she did though. When she was chairman of the EPA she started writing regulations left and right without even the agreement of the whole agency. Not that she needed it, ’cause they were all like-minded leftists. But none of it had to go through Congress. None of it passed as legislation must. And so now Scott Pruitt, they’re focusing on this guy, condos that he wants to buy, furniture he wanted to rent, how he travels privately, running around on jets. They are launching everything they’ve got at this guy. The EPA is one of these federal bureaucracies that the left claims permanent ownership of. And these bureaucracies — they happen to be where the deep state — I love that term primary because the left hates it — but the bureaucracies are where the deep state lives. And these people have been writing punitive anti-capital, anti-liberty regulations for who knows how long, all predicated on a bunch of faulty premises, such as the United States is destroying the planet, such as the United States is destroying the world, such as the United States is the leading polluter of the world. None of these things are true, of course, but that’s their worldview. And one thing that Pruitt’s doing that’s got them just hog-tied, he’s relaxing all of these mileage restrictions that the left has placed on automobiles and engines and so forth. And he’s basically just taking a knife and whacking things from the EPA that were implemented during the eight years of Obama. PRUITT: I did not. My staff did and I found out about that yesterday and I changed it. HENRY: Is somebody being fired for that? HENRY: So who did it? PRUITT: There will be some accountability. HENRY: You don’t know, you run the agency, you don’t know who did it? PRUITt: I found out about this yesterday, and I corrected the action. So we are in the process of finding out how it took place and correcting it. HENRY: So hang on. Both of these staffers who got these large pay raises are friends of yours, I believe from Oklahoma, right? HENRY: They’re friends of yours? PRUITT: Well, they serve a very important person. PRUITT: No. What is it? HENRY: Fifty-seven thousand a year. PRUITT: They did not get pay raise. They did not get pay raise. HENRY So you stopped it. RUSH: Let me ask a question. You know, they’re going after Pruitt, how come Strzok and Lisa Page haven’t been canned? How come they are still getting every benefit, every perk and their salaries even though they’ve been demoted and reassigned, why are they still even working there? See, this is how we lose focus of this stuff. Oh, so now all of a sudden we’re gonna be concerned with how much money federal employees get? I thought we didn’t want to do government shutdowns because federal employees would miss Thanksgiving and Christmas turkeys and it just wouldn’t be fair. Anyway, Pruitt is claiming he reversed these excessive pay raises when he found out they happened. Anyway, Pruitt is claiming he reversed these excessive pay raises when he found out they had happened. But this has nothing to do with what Pruitt is doing that has them all ticked off. So they’re going for these, you know, little knickyknack things here that — do you think people even kept track of what federal employees were making during the Obama administration, and if somebody had gotten a raise would anybody have been upset about it? No, because federal government employees were constantly being applauded and supported and so forth. But this is just a good illustration of they can’t — didn’t even go after Pruitt on the substance of what he’s doing other than to say he can’t do it. But all he’s doing is utilizing the same, what do you call it, procedures, that Obama’s EPA director did, and it’s funny to listen to her and read her being all just jacked up about this claiming, “You can’t go in and do this willy-nilly and arbitrarily,” which is exactly what she herself did. PRUITT: In February of 2016 — and I will tell you as I sit here today, as I’ve walked with him and served him — I didn’t know the president at that time. PRUITT: I’d not served him at that time. And I will tell you the changes that we’ve seen take place, his commitment to rule of law, his commitment to process, the regulatory changes we’ve seen, are his leadership making it happen. Look, I was misinformed. HENRY: Do you take responsibly? HENRY: By your team, so do you take responsibility? PRUITT: I’m fixing it. I’m fixing it. PRUITT: I’m fixing the problem. RUSH: I really hope this guy does not get sidetracked. You know, it’s tough to hold up under this kind of assault. And now this is coming. That’s Fox News. That’s Ed Henry. And you just hope that he can hang on. You don’t know until you see these people under fire and man is he under fire. He’s under fire for excessive luxurious travel arrangements and accommodations. Of course, they don’t tell you about the exorbitant luxurious expenditures in the EPA under Obama and his administrator Gina McCarthy. In 2016, for example, Gina McCarthy spent 68 grand going to Ghana, 45 grand going to Peru, $74,000 on a trip to Tokyo. In 2015, $41,000 traveling to Paris, $90,000 going to Dubai, $67,000 to Tokyo again, $56,000 to Italy. And of course Lisa Jackson, who was the EPA director for Obama before Gina McCarthy, who’s now the environmental vice president at Apple, she was just as over the top in her expenditures. So Pruitt’s not doing anything that hasn’t been done. I’m not saying that’s an excuse to continue it. I’m saying this is a bogus series of charges. He’s being singled out for doing something that has always been done because that’s how they view the best way to go get the guy and discredit him, rather than to try to frighten people about what he’s doing with the regulatory side of things. Let me take a brief time-out. I just hope Scott Pruitt hangs in, bottom line.